The Torch Run is a grassroots movement established to raise awareness and funds for Special Olympics athletes. A long time supporter and participant, the MPPA is the Premier Sponsor of the Law Enforcement Torch Run since 2000. Hundreds of members of the MPPA participate in the Torch Run annually. The Torch Run sponsors numerous awareness raising and fund raising events each year, including Polar Plunges, Penguin Plunges, Presidents Day Plunge, Sweetheart Passion Plunge, Grizzly Dip, Fire Truck Pull, Duck Regatta, building sits, team roping and more. 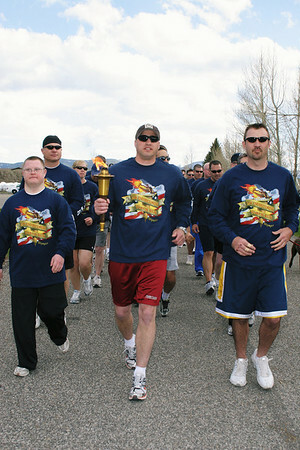 To learn more about Montana Law Enforcement's support for the Special Olympics, visit the SOMT webpage for photo albums, events schedules, newsletters and more!